Rubenerd: Yasmine’s Getting Married Cancelled! Okay so I was watching television before the Hungarian Grand Prix started and I saw and advertisement for "all new episodes of Futurama" on Channel 10 (Australian TV network). I thought it was awesome they were putting it on during primetime, but I thought it was supposed to be taken up by that new "Yasmine's Getting Married" show. 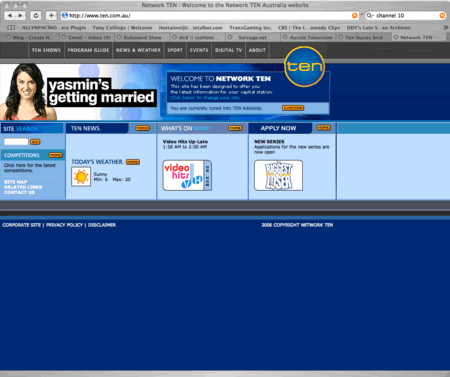 "Yasmine's Getting Married" was another "reality" TV show created by the already reality saturated Channel 10 Network with the idea of aiding the protagonist Yasmine in her quest to find true love and ultimately marriage. YASMIN’S not getting married, after Channel 10 has left its would-be bride at the altar, canning reality TV series, Yasmin’s Getting Married, after just one week. The show – playing cupid to find a young woman a husband – was dumped today after a pitiful ratings debut. After only one week. “Yasmin Is Getting Married” has been dumped in a screaming heap. I wonder what happened? Was it the fact that the ratings for it made a Ten viewing graph look like lightening hit the transmitter at exactly 7pm? Was it the fact that, even though I am sure they ment well and were going into it for fun, the men who had been shown thus far all had a massive ‘stalker’ vibe about them. Or was it simply that Yasmin was one of the most anoying people on Australian Television outside of the Big Brother house. Any way you look at it… The end of this nightmare is a victory for common sense and a true tribute to my theary that there was a line that viewers wouldn’t cross and a network finally heard our angry screams for justice. I hate most reality television with a passion, and Channel 10 seems to create the worst. Big Brother is pathetic, Australian Idol is just boring, The Biggest Loser is misguided and irritating, and this latest show seemed like just another crappy done-on-the-cheap show the network created just so they wouldn't have to hire actors or scriptwriters (assuming of course that "reality" TV isn't scripted, which I'm inclined to believe is true, but let's not get into that yet!). Don't get me wrong, I have no problem with Yasmine and I wish her the best in her quest, but believe me I'm not the least bit upset to see this rubbish go off the air. Older post → Jenson Button Wins!